Last year, I had my first cooking attempt with wheat berries when I made the Back on Track Wheat Berry Salad. I fell head over heels. Wheat berries are chewy, versatile, and they pack a great nutritional punch. And then I discovered spelt berries. I am a fan of spelt because it has a fabulous, wholesome, nutty flavour and it’s also easier for my tummy to digest. I knew I had to try some out, so naturally I bought a 25 pound bag of them. It was do or die. 1) Overnight spelt berries: I soaked the spelt berries overnight in water and discovered by morning they had softened up enough to be edible- even without cooking. Lately, I have been soaking spelt berries overnight and then sprinkling them on my salads, all without having to turn on the stovetop. It is a great time saver! I soak a big batch on the weekend and I have been enjoying them all week on my lunchtime salads. 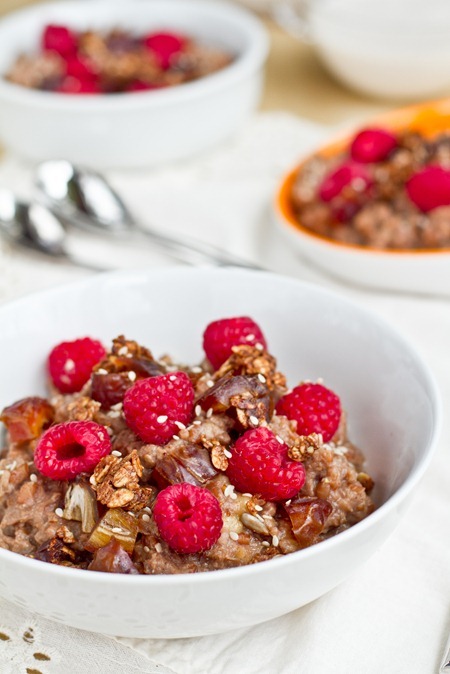 They are also fun mixed into some vegan overnight oats! I looked up the nutritional information for both spelt berries and wheat berries. Their profile is almost identical, with a few small differences here and there. You can’t go wrong with either wheat berries or spelt berries. I do find the flavour of spelt berries is a bit more nutty tasting though. 3) Versatility: Spelt berries (and wheat berries) can be used in all kinds of fun recipes like stuffing, porridge, pudding, rice pilafs, muffins, and more. I can’t wait to experiment more with them! This was my first attempt at making Spelt Berry Porridge which was inspired by a Wheat Berry Pudding recipe from Eating Well. I’m also assuming that you could substitute wheatberries in this recipe below if you wanted to! 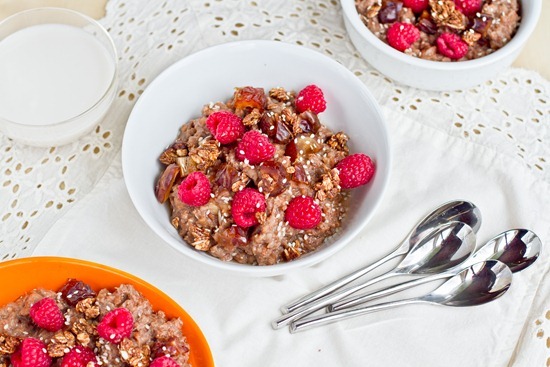 This spelt berry porridge is a fun change-up of the normal oatmeal breakfast routine! Spelt berries have a wonderful chewiness to them and a delicious nutty flavour. This recipe below is customizable and all kinds of flavours and mix-ins would work here. 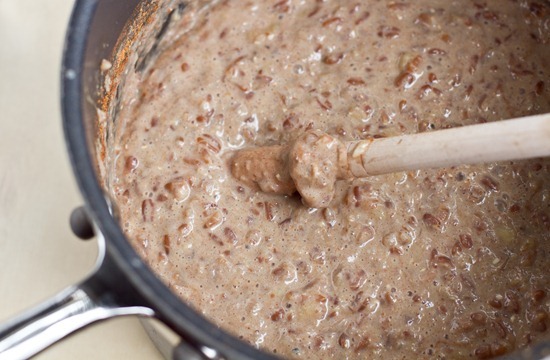 Add your favourite fruit, nuts, seeds, granola, sweeteners, and nut butters as desired. Inspired by Eating Well’s Wheat Berry Pudding. Yield: ~4 servings (about 4 cups) <—you can enjoy for a few mornings! 1. Rinse spelt berries in a colander. Place 1 cup uncooked spelt berries into a pot and add water to cover by 2 inches. Bring to a boil, cover, and simmer on low for about 35-45 minutes, or until tender (you still want them a bit chewy). You can do this step ahead of time. 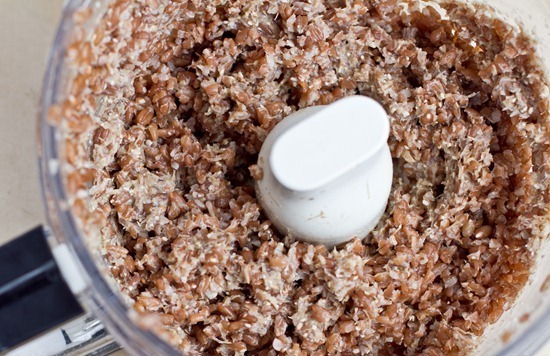 Drain and transfer into a food processor. Add two tbsp non-dairy milk and process mixture, stopping to scrape sides of the bowl, when necessary. You want some of the berries chopped and some of them whole (see processor pic below). 2. Scoop the chopped berries back into the pot along with 2 cups non-dairy milk, cinnamon, salt, bananas, optional nutmeg and ground cloves. Stir well and simmer on low for about 10 minutes until thick, stirring often. Remove from heat and stir in the vanilla and maple syrup. 3. Pour into bowls and add your desired toppings. I used dates, raspberries, and granola, but the sky is the limit! Makes almost 4 cups worth. Store leftovers in a container in the fridge. To reheat add a tablespoon or a bit more of non-dairy milk, stir, and microwave until hot. I just loved this Spelt Berry porridge…maybe even better than oats. It was just so chewy and really fun to eat. After cooking the berries, rinse, drain, and then transfer to the food processor. Add two tbsp of milk and pulse until you have achieved this consistency below. You still want some that are intact as they will provide a great texture in the porridge. Chopping/processing the berries allows them to get really creamy when you cook everything in the pot with the milk. Add the processed berries and rest of the ingredients into the pot (except vanilla and maple syrup). I decided to add three bananas because the recipe makes about 4 servings. I mashed two bananas (so their flavour could soak into the porridge) and also chopped 1 banana (for texture) and stirred everything together. After 8-10 minutes of cooking on the stovetop, you will have this creamy deliciousness! Stir in your desired amount of sweetener and pure vanilla extract. Add your desired toppings and enjoy! The great thing about this recipe is that you can make a batch on the weekend and then enjoy it for a few days! To reheat, just stir in a tablespoon of milk and reheat in the microwave or on the stove top. I find that it reheats very well. I added raspberries, dates, granola, sesame seeds, and a bit of sweetener on top and it was delish. On a sad note, my thoughts go out to those inflicted by Japan’s earthquake and Tsunami. I felt a bit silly for complaining about our snow and rain this week when I heard about what had happened. :\ It really puts things in perspective, doesn’t it? Canadian Red Cross is accepting relief donations here. Do you recognize these FL doggies? Spelt berries? I don’t know where I thought spelt flour came from, but I didn’t know there was such a thing as spelt berries! The iron and protein in these are awesome. I’m always trying to get more of both. Even if you can’t make a financial donation, they always need blood! With the bad weather this winter, the blood banks are running low. Eat some iron-rich food (spelt berries!) beforehand because you can’t donate if your iron is too low (common for those that don’t eat red meat). Those raspberries are the most beautiful color I have ever seen!!! i hear about the earthquake and tsunami in Japan this morning on my way to work. wow how terrible, definitely makes you appreciate where you are, even with a little cold weather and snow hey. My thought are with everyone there. I’m just waiting to hear if anything more happens in Hawaii or BC since they have warnings as well. on a happier note, those raspberries look so delicious! The images coming out of Japan this morning were the most terrifying I have ever seen. I never imagined destruction of that scale happening so quickly. this looks tasty! plus anything with dates, granola, and raspberries (just a few of my favoriteee things!) will no doubt be delicious! I love all your recipes Angela! I just cooked with spelt flour last night for the first time! Do you happen to know a good replacement for bananas? For some reason since birth I cannot stand bananas. I have tried to like them, but I just cant! So many recipes call for bananas and I sometimes use applesauce. I wish I liked them! 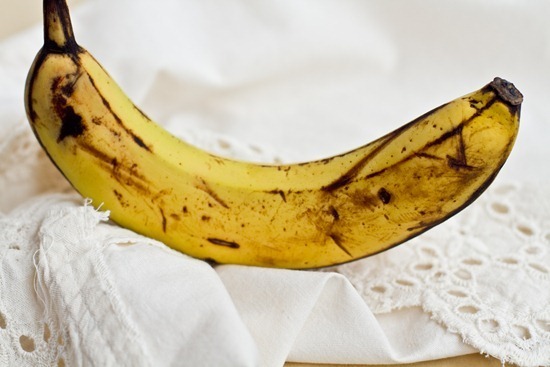 It is much harder to be vegan when you cant stand the taste of bananas! I have seen some people use pears with good results in their oatmeal…maybe that would work? Or you could try pureed dates for some natural sweetener. Maybe some other readers have suggestions too! looks amazing, you should open a spa! I love your breakfast recipes! i have to try spelt berried…soaking would be so much easier! I was thinking the same thing! I have to take things onto our little balcony to get anything close to that, haha :) Gorgeous photos! This looks delicious Angela — you always have such creative breakfasts! I heard about the tsunami and earthquake this morning – how terrifying! Thanks for linking the Red Cross. Wow I’m SO intrigued by wheat berries and spelt berries! I love your idea of soaking them overnight, too. I’m all about shortcuts! :) Definitely bookmarked. wow…eye candy! 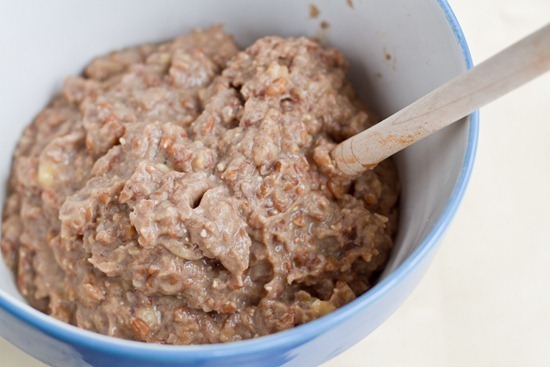 As much as I love oats…I’m always on the lookout for other inventive porridge ideas…this is a must-try. Your recipes/photos are simply stunning, angela. Would love to try it with wheat berries… love them! this recipe looks really fun and delicious! I like how you’ve been eating them after simply soaking them. That keeps them raw, too! 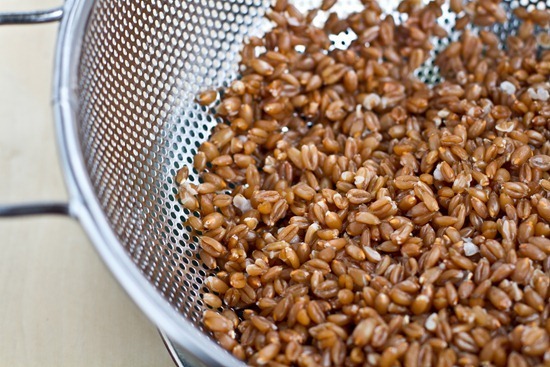 Sprouted wheatberries are awesome… I wonder if it would work with spelt. this looks like such a wholesome dish! I’m gluten free but know some gluten – intollerant folks who can have spelt…I need to get the courage to try it! I’m a huge fan of chewy grain breakfasts. 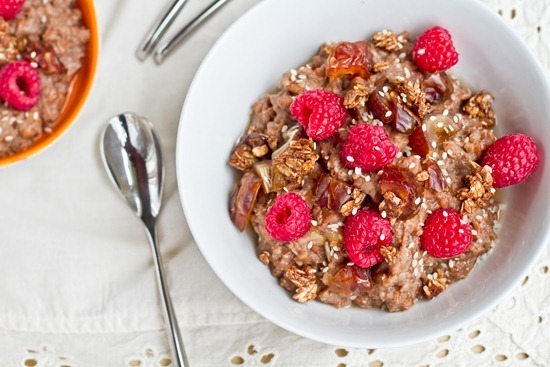 Barley is awesome with fruit and nuts…is the texture of soaked spelt berries much different? I don’t know if I have ever had barley some to think of it! What about those fab barley risottos of yours? I was thinking of buckwheat groats for some reason. The texture is VERY similar to answer the original question! Glad you liked it! :) I need to make it again soon. 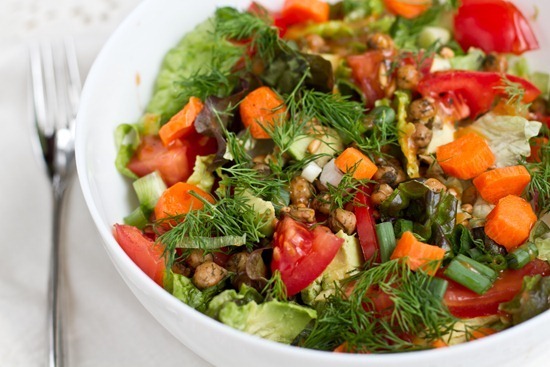 That salad looks so amazing, and so packed full of nutrients! 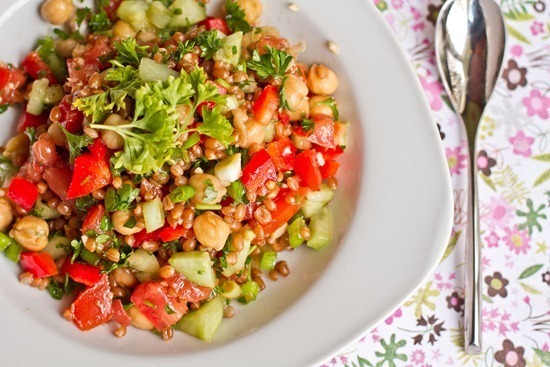 Your wheatberry salad looks divine! This looks delicious. The raspberries add gorgeous color. I’ve been complaining about the snow in Alberta for weeks now…when will winter ever end!? On a more positive note, I must look into these spelt berries you speak of…..! Anything with berries that pretty has got to be tasty! MMM! I’ve never had spelt berries, but this porridge looks delicious! I’m trying to try branch out and have different hot breakfast cereals other than oats for breakfast. I’ll definitely put this on my list! Natural disasters really do put things into perspective. It makes all of the small worries in our lives seem not so big after all! I don’t think I’ve ever heard of wheat berries or spelt berries… I may just have to try them! Oh my goodness, that is just so sad about the earthquake and tsunami. As I was watching the breaking news on CTV this morning, my heart was breaking. That title totally grabbed me! 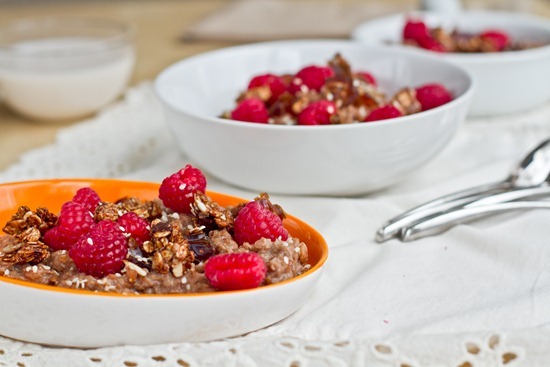 I love wheat and spelt berries….and for breakfast?! Even better! Can’t wait to try this! That salad looks amazing! I’ve never tried spelt berries, but if I can cook them so that they look like this, I’ve got to try them! I wonder if I could make this with rice [gluten free]. Only one way to find out! Thanks for bringing attention to the happenings in Japan. It really makes you value what we have here, even if the weather is cold and the darn snow wont melt. We live in a pretty amazing country! Dates, raspberries, seeds, and all that goodness are my faves on top of b’fast! J’adore porridge! SInce I’m gluten-free, I will most likely be trying this combo with quinoa or amaranth. Thanks for the recipe girl!! Yum! I never even knew that there was such a thing as spelt berries. I tried your wheat berry salad a while back and it was really good. I’ll have to keep my eye out for spelt berries so I can try your latest recipe!! It is so pretty! I think raspberries are the most photogenic berry. I forgot about daylight savings and your comment made me so happy! Mmmm, looks super yummy- never would’ve thought to use speltberries! Thanks for putting the red cross link on here. It is a very sad day for those affected and if we can help, let’s do it! Ahhh I tried spelt berries last week and fell madly in love, the texture is amazing and they are super filling. I made them savory so im excited to try out sweet! Thanks for bringing attention to the earthquake in Japan, Angela–my family lives there (about three hours away from where the quake actually happened, so they’re fine) and I haven’t been able to concentrate on anything else all day. It’s heartening to see bloggers like you expressing your concern even if you aren’t affected directly! I’ll keep your family in my thoughts! This looks so interesting. I’m going to have to keep my eye open for spelt berries! I must say your photography is absolutely beautiful today. Have a wonderful weekend! This looks lovely Ange- the colours are gorgeous! I love spelt berries too, and like you, I’ve got an enormous supply! 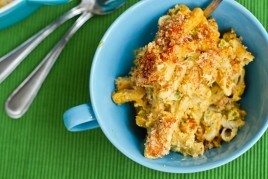 The plan is to get cookin’ with them this weekend so maybe I’ll make this! I am SO sad to see all the destruction in Japan. It’s just horrible. :( I keep seeing all the footage and it just breaks my heart. Those poor people ! I live in So Cal and woke up with a phone call from my MIL telling us to turn on the news around 6:45 local time. B and I hopped in the car and raced over to the cliffs over the ocean near where we live… we waited about an hour for the tsunami before leaving. SCARY. I didn’t. We waited there until around 9 and then headed for home… Our beaches here are south facing, so I was pretty sure nothing much would happen since it was coming from the west. …but I had to see for myself. I like how you called them spelt berries. Most people (I think?) in the US call them wheat berries. Because I try to avoid gluten, I havent actually ever had them but they look like something I would LOVE…sort of chewy and perfect. Mmmm, so good. I want those raspberries, too! Oh yes please!!! Spelt and wheat are different grains. The gluten in spelt berries is more easily digested than the gluten in wheat so if wheat upsets your stomach you may be able to enjoy spelt. This looks phenomenal! I can’t eat gluten, but I have some GF oat groats from Cream Hill Estates (a Canadian company :) ), so I’ll have to try this with those. From your picture and description, they sound like they’d be nearly identical! i’m going to have to find some spelt berries. they sound delish!! Yesss indeeed our friends in Japan need all the help and prayers possible. And even where I live in Cali, who knows what will happen? Life is so short and to be treasured every waking moment. I’ve always loved wheat berries but have yet to try spelt berries. A nutty flavor is always a welcome addition, though. I also love the fact that I wouldn’t have to turn on the stove! I’ll have to try this porridge! The addition of raspberries is such a beautiful pop of color! One of my favorite vegan cafes makes a really good spelt berry salad, but I’ve never made spelt berries at home. I really should, because I’m in love with their chewy consistency. Maybe I’ll try your recipe! The picture is beautiful! Great recipe, Iv never heard of spelt berries. You got a thing for raspberries lately! Hearing about Japan was absolutley devastating, I am so thankful for not living in an area of tsunami/earthquake risk. What a lovely breakfast alternative. I love learning about news grains! This looks amazing! 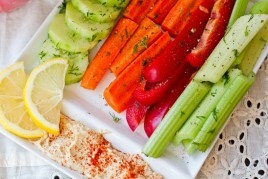 I am trying to get different grains into my boyfriends diet, so now I have to try this!! I love new ways of enjoying creamy breakfast hot cereals. Thanks for the recipe. I’ve never been able to find spelt or wheat berries! I’ve been wanting to try them ever since you posted that wheat berry salad! Such sad news about the earthquake in Japan. :( All the news footage I’ve seen is so devastating! Thanks for the link/thoughts on Japan. I am devastated. We’ve had tsunami warnings here but the coastline was fairly okay. I’m just horrified and desperate for them. I find it really hard to read blogs about life when people don’t acknowledge disasters, does that make sense to anyone? I am currently living in New Zealand and we thought the quake in Christchurch was devastating. What word even describes the level of devastation in Japan? Yum! I love new oat recipes! This looks so good! I’ve always wondered what to do with those spelt berries I’ve seen in stores. And I didn’t really know what they’d taste like either. 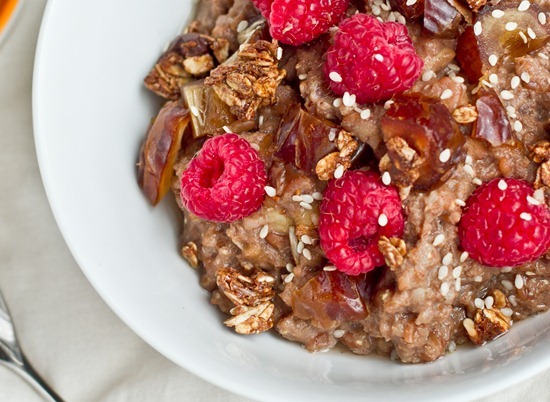 I love oats and this is another great addition to them! this looks delicious! ive never ever heard of spelt berries! 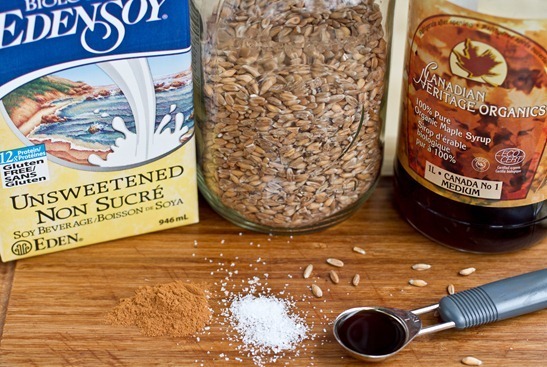 I have to try this, too bad I already made oatmeal this morning. I even have some cooked wheat berries in the fridge, so perhaps for tomorrow’s breakfast. what a treat! I love your spoons too. :) I will have to try this. You are so great to provide the link for the red cross too. So sad. I have never tried spelt berries but I know I love wheat berries! This is my favourite wheat berry salad recipe and I bet spelt would work well, too! I am eating this now and it is scrummy! If you don’t have raspberries, try topping with apples. Yummers! So lovely to meet you, Vera! Thanks so much for the great comment. I’m thrilled you enjoyed the recipe! 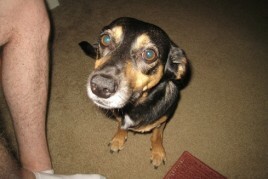 Previous post: Do you recognize these FL doggies?